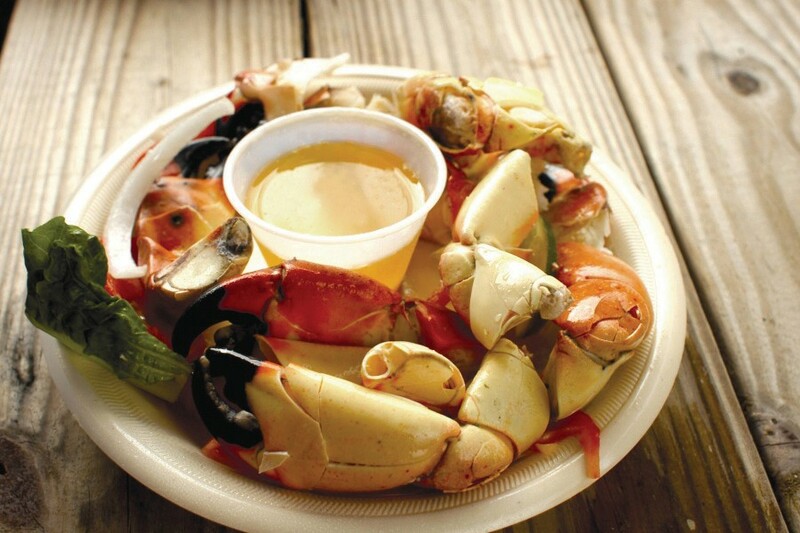 You can’t go wrong with Pinchers’ stone crab claws. You rememer Sally who used to sell seashells by the seashore? Well, that old broad retired and is now selling crabs on Duval Street. Her new joint, Pinchers Crab Shack, is in the heart of Old Town Key West at 712 Duval St.
It’s your go-to dining hot-spot for seafood and a laid-back island atmosphere. Don’t let the Duval Street location fool you — the food is good, and the service is great. Pinchers has 12 locations in Florida and is known for its delectable seafood options (especially when that seafood is caught in local waters). The open-air Key West location caters to seafood lovers with the freshest varieties of fish, crab and shrimp. I was in the mood for some seafood last week, so I decided to make my way downtown. After scrounging for parking, I found a spot and I made my way up the stairs to the eatery. The islandinspired décor reminded me of a surf shack in the Caribbean where you can rent a board, grab a six-pack of Corona and chow down on crab claws so fresh they were swimming just hours earlier. The host greeted me and seated me at a table outside overlooking the chaos that is Duval Street. 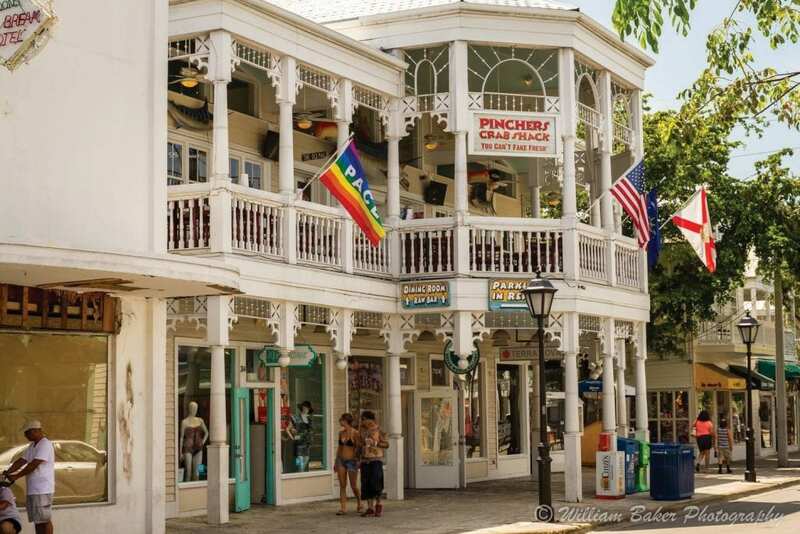 Pinchers offers both indoor and outdoor seating, but the outdoor seating is perfect for people watching and enjoying the beautiful weather our island is known for. I started with the fried calamari because — hello — it’s fried. Think freshly breaded and deepfried squid cooked to a golden-brown perfection and served with a tangy marinara sauce. I also ordered my favorite appetizer, the ahi tuna. Pinchers’ ahi tuna is covered in a tuxedo of black and white sesame seeds then pan-seared to a cool rare temperature. It’s served on a bed of lettuce with a side of sriracha glaze, wasabi and soy sauce. And it was to die for. The sriracha glaze adds the perfect kick of spice and flavor to the already delicious (and fresh) fish. For my entrée, I decided on the jumbo lump crab cakes. These babies are loaded with luscious crab meat and served with steak fries and garlic mashed potatoes. Hey, don’t you judge me! A girl likes her carbs, and considering I took the stairs to get to the restaurant, I felt entitled to double dip. As a Key West native, born and raised, I have ridiculously high standards when it comes to fresh seafood and those crab cakes exceeded even my lofty standards. 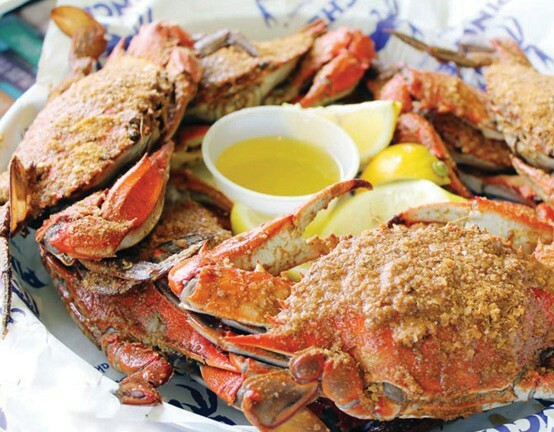 Crab dusted with Old Bay seasoning is a Pinchers favorite. Since Pinchers is known for all types of seafood, I couldn’t leave without trying the oysters. Pinchers harvests oysters from the Gulf of Mexico and serves them either naked or steamed. I prefer mine naked with hot sauce (make that lots of hot sauce) and some fresh lemon juice. They were out of this world. I devoured half a dozen and could have totally splurged on at least six more. At this point in the night, I lost count of calories and was just eating everything in sight. Dear Diary, my diet starts tomorrow. For vegetarians, Pinchers has several options, including mozzarella cheese sticks and pasta alfredo. Side dishes include everything from locally grown green beans to steak fries. Entrees read like a lineup of the best seafood around, including fried fish like grouper and mahi mahi and pasta dishes like shrimp scampi and mussels marinara. Oysters are always fresh and delicious. 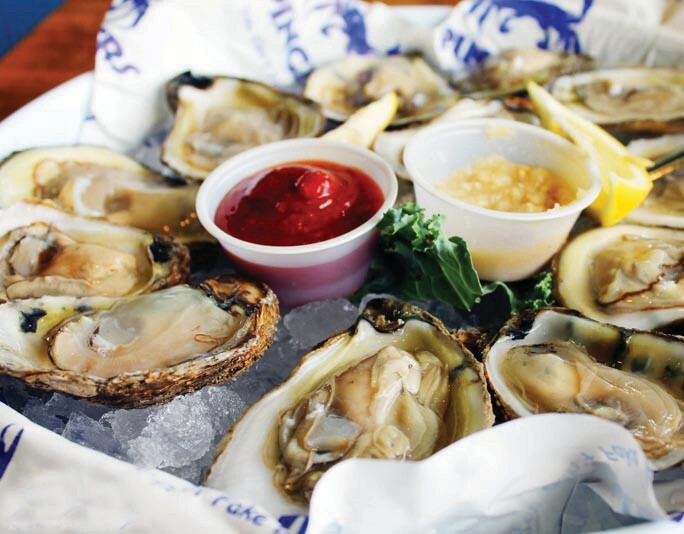 Pinchers also serves peel-and-eat shrimp, oysters and clams by the half or full dozen. The peel-and-eat shrimp are seasoned with Old Bay and can be ordered hot or cold. Oysters and clams can be ordered as they come or lightly steamed. If you’re a crab lover, Pinchers is the place for you. I mean, with a name like Pinchers, what did you expect? You can pick your style: steamed in Old Bay, sautéed in garlic and butter or sautéed in garlic and butter with secret spices. The eatery offers an assortment of crabs for you to choose from, from snow crab and Alaskan king crab to Maryland-style blue crab. If you’re not a seafood lover but got dragged to dinner, fear not. Believe it or not, Pinchers has some of the best barbecue on the island. Try the baby back ribs (and be warned: You’ll need more than a few napkins). Now, let’s talk about the drinks. I hope you’re thirsty, because you’re definitely going to want to order one of Pinchers’ mammoth fish bowls filled with liquor. It’s something you can share — but then again, when was the last time you saw more than one fish in a fishbowl? Exactly. The food at Pinchers is fresh and delicious. It has everything to appeal to your seafood cravings, and I’m talking about everything — from shrimp, stone crab and lobster to several varieties of fish. I was impressed by the flavors incorporated in each item I ordered. Everything was cooked perfectly and tasted fresh, like seafood should taste. We learned that there is a surf shackstyle restaurant on Duval Street with your name on it. Head downtown, order an obnoxiously large drink and plan to eat away your problems at Pinchers. You won’t be disappointed in the freshness and flavors.